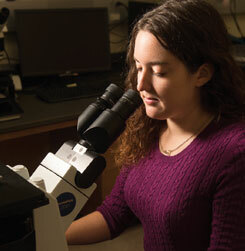 The degree requires a minimum of 38 hours of Biology (BIOL) courses, of which at least 26 must be above the introductory level (200 or higher) and at least 18 hours must have been taken at SIUE. As biology majors, students in the medical technology curriculum take three years of prescribed course work at SIUE, then complete a fourth year of clinical/professional study in the clinical laboratory at one of SIUE’s affiliated hospitals. These students are not in residence on the SIUE campus during their senior year. Intern students move to the vicinity of the hospitals in St. Louis or Springfield. The department views the senior assignment for medical technology students in two ways: (1) successful completion of the hospital calendar year education program, and (2) achieving eligibility to apply for examination by the Board of Registry of the American Society of Clinical Pathologists, the certifying professional body in the United States. An outcome assessment also is provided by the scores received on the registry examination, which compares SIUE students’ performance with other students in the United States who take the examination at the same time.